The Nifty 90 cherry picker is a fast and cost effective alternative to ladders and scaffolds. Its compact and low weight design allows the Nifty 90 cherry picker to be towed more economically by smaller vehicles and set up in confined spaces where its simple, reliable hydraulic controls that make even first time operation straightforward. A telescopic axle allows the Nifty 90 cherry picker to pass through 0.75m (2ft 6in) openings and doorways giving better access to job locations and a 'zero emission' battery power pack as standard means it to work cleanly and quietly both inside and out. 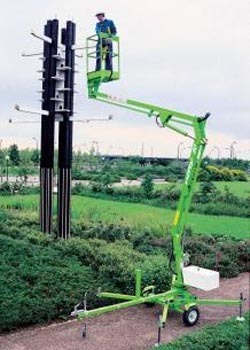 Lock valves on all lift cylinders, micro-switch interlocks on all outriggers and a harness point in the cage help to ensure that the Nifty 90 cherry picker is safe to use, giving its operator the confidence to complete their task quickly and efficiently. To tell us what you think click here!